While last few years have been tough for Uber – it’s been plagued by toxic company culture and accused of avoiding regulations and ‘gaming’ the system — the new CEO is making sure Uber is on its best behavior. And it’s paying off. The new peaceful strategy has resulted in Uber’s return to London — its largest European market — and more recently to Germany, after being kicked out early last year. Uber has even partnered up with private taxi services and taxi companies in Germany that possess required licenses, so that it can start operating in the country as soon as possible. The new approach is meant to seize as many markets as possible, even if that means siding with the competitors (e.g. taxi companies). ‘Increase the growth and curtail mistakes’ is what’s gonna get Uber ready for an initial public offering (IPO) that it has just filed for early 2019. But to catch investors’ eyes, Uber has to disrupt the world of transportation once again, and its three grand ambitions are meant to do exactly that. So I wonder, what do these grand ambitions mean for us, the public, and shall we embrace the disruption? Uber’s latest service — Ride Pass — is offering customers a subscription plan of $14.99 per month, or $24.99 in Los Angeles, to avoid surge pricing. The service has rolled out following Lyft’s announcement of $299 All-Access Plan subscription, granting up to 30 rides, of which all must be under $15 or Lyft will charge the difference. But for Uber to turn cars into horses, it will need to provide some real value to its users. The new subscription option sounds appealing at first as riders can evade dynamically adjusted prices in the times of high demand, but Uber created this price-inconvenience in the first place. Last year, when the New York City was caught in a heavy snow storm, Uber’s algorithm increased prices to over four times the regular price. One woman was stuck in Bronx and tried to call Uber but the prices were skyrocketing. Many other New Yorkers were outraged. Thus for us, as users, the deal is just not yet sweet enough – we are asked to pay for the inconvenience that we did not want in the first place. Drivers are in no better situation either when it comes to surge pricing. Last year Uber was hit by a class action lawsuit in California on the accusations that riders are charged more during the surge, whereas the drivers don’t always get the cut they are entitled to. Thus it’s debatable whether the higher prices during surge benefit everyone proportionally. The problem is the overall architecture of Uber-like platforms, which has been built in a way to increase information asymmetries. In other words, while Uber knows the exact distance a rider travels to, prices charged, and surge-price coefficient, neither drivers or riders have such information. This gives platforms the upper hand and the ability to game the system if they wish to. But surge pricing is not all that bad — it very efficiently matches supply and demand — but rules of the game need to be enforced to protect riders and drivers. First, a maximum surge-price coefficient needs to be prescribed by the regulations to prevent possible opportunistic behavior. Second, a part of the higher fee riders pay should go towards increased insurance premiums for drivers, who face a higher risk of an accident during the bad weather conditions, which often see surge pricing. Insurance companies should also have dynamic coverage suitable for this new way of transacting. Finally, the last part of that higher fee should go to Uber for facilitating the matching. Uber has so far seized only 1 percent of transportation systems around the world, but it’s now ready to take a bigger chunk of the pie — cities’ entire public transportation system. “I want to run the bus systems for a city… I want you to be able to take an Uber and get into the subway… get out and have an Uber waiting for you, ” said Mr. Khosrowshahi, Uber’s CEO. This raises the question whether it’s a good idea to have a for-profit ride-hailing company responsible for our public transportation, considering that in many cities buses and trains have been an affordable mode of transportation, accessible to all. Whether a ride-hailing company should be in charge of our public transportation depends on what that would entail. Will it be regulated like a public transportation company? Possible, but unlikely considering that Uber, for example, has heavily resisted being regulated in the past, insisting that it’s a technology company and not a transportation company. On the other hand, if safety standards are met, a private company such as Uber would be much quicker to adapt and implement technology that could be beneficial for us as users. Some cities such as Innisfil, Canada and Summit, New Jersey, USA have already taken a radical step of letting Uber fill in the gaps where the public transportation comes short. These cities are subsidizing Uber rides to meet residents’ transportation needs. While these cities could also invest in new bus and train lines, they are costly and take long time to build thus a ride-hailing alternative seems like a better option. Other cities are realizing that if Uber can do it, they can do it to. Austin, for example, has launched its own Uber-like app, allowing people to request rides within service zones from their mobile phone. Ford’s Chariot, on the other hand, is creating an on-demand bus service, providing more flexibility than the traditional public transportation system. While the idea of Uber-like platforms running the public transportation is appealing due to their efficiency, we should not forget the technological component inherent in these platforms. Their algorithm, for instance, could account for times of high demand (rush hour), requesters’ location (rich vs. poor neighborhood), and daily commute routes, giving them a possibility to price discriminate. Unfortunately, we do not yet know how to deal with these potential threats. A solution could be for municipalities to lease the technology from ride-hailing companies instead of giving them a license to run the transportation system. In this way municipalities could make use of public unutilized vehicles (e.g. yellow school buses) and offer on-demand public transportation during idle hours. There would still be additional room for ride-hailing companies, which could manage demands of more picky customers who value fast service or have special needs. Uber is onto an even more ambitious challenge — a launch of Uber Air — a flying taxi. The flying car or air taxi could potentially be a $5-billion market, so it’s not a surprise that giants such as Toyota, Daimler, Volkswagen, Boeing, and Airbus also have their eyes set on the prize. Uber’s flying taxi is expected to have a range of about 60 miles or 97 kilometers. 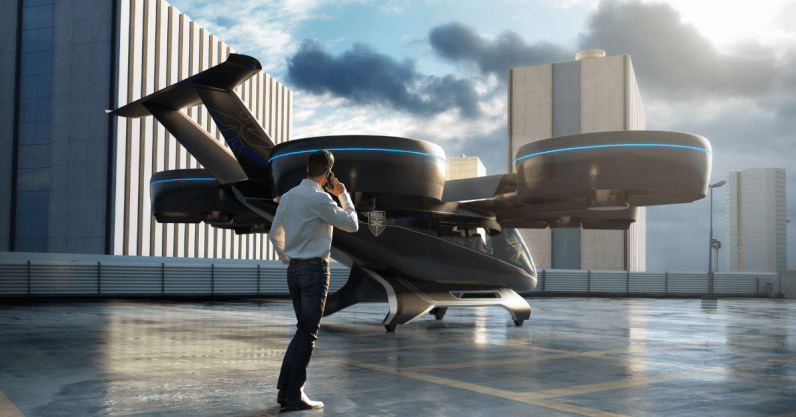 It will be electric, supporting a vertical take-off and landing, and with minimal noise, making it suitable for lower altitude and short city-to-city commutes. Uber has partnered up with five airplane manufacturers: Karem, Embraer, Pipistrel, Boeing subsidiary Aurora Flight Sciences, and Bell, which will develop an aircraft for Uber Air. Eventually, these aircrafts will be pilotless — Uber is consistent with this on the ground as well as in the air — they are going for full automation. This means Uber chauffeurs and pilots will be out of job in just few years’ time. While it sounds scary, these people will simply need to transition to new jobs and use existing skills or develop new ones to aid this transition. Artificial intelligence could come in handy here, finding completely new jobs for people with already acquired skills. Uber is already helping eligible drivers explore new professions by offering a full tuition coverage for an undergraduate degree, but it needs to do much more in the future in order to help drivers switch jobs when its strategic plans become reality. The flying taxi could come in handy for business people who need to commute on frequent basis but still want to be home for dinner. However, it is unlikely that this service will be affordable to the majority of the population, although Uber suggests so. Let’s also not forget the regulatory changes that need to be made, safety regulations that need to be implemented and infrastructure that has to be built to make this possible. If it’s going to be for a handful of people only, I wonder if it’s worth it. When we are talking about reduction in car ownership, public transportation, and flying taxis, or transportation in general, we cannot forget the interests of the wider population. More than 50 percent of the world’s population has been practically forced to move to urban areas — from this perspective transportation becomes a human right. Ubers, Lyfts, and Birds are great and let’s go for electric vehicles, full automation and pilotless taxis, but let’s make them accessible to all.